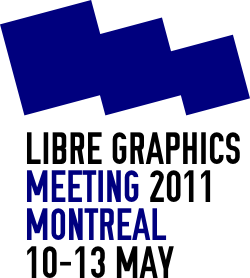 The Libre Graphics Meeting exists to unite and accelerate the efforts behind Free, Libre and Open Source creative software. Since 2006, this annual meeting is the premiere conference for developers, users and supporters of projects such as GIMP, Inkscape, Blender, Krita, Scribus, Hugin, the Open Clipart Library, and the Open Font Library who gather to work on interoperability, shared standards, and new ideas. Work at prior LGMs has pushed the state of the art in important areas such as color management, cross-application sharing of assets, and common formats. Face-to-face meetings and opportunities for collaboration are important to users and developers alike; in the form of tutorials, talks, workshops, and birds-of-a-feather (BOF) the event offers many formal and informal opportunities to interact.